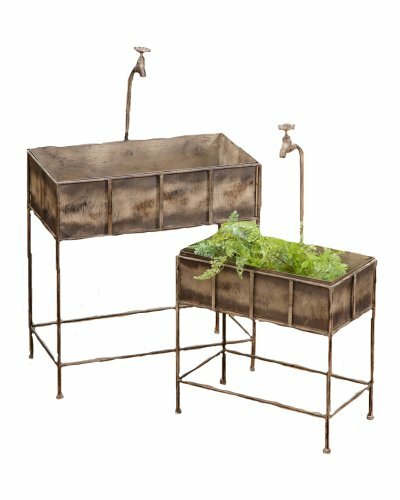 Your Hearts Delight lg 24 1/2" W x 39" H x 13" D Rectangle Faucet Style Set of 2 Plant Stand. Your Hearts Delight by Aubrey provides primitive home decor items including seasonal items, everyday products, garden and patio creations, charming stitchery and so much more. This accent piece is sure to help enhance any decor. Measures lg 24 1/2" W x 39" H x 13" D. Made of tin. Stylish decorative accent for any room decor. Great gift for family, friends, neighbors and acquaintances. Set of two pieces. If you have any questions about this product by Your Heart's Delight, contact us by completing and submitting the form below. If you are looking for a specif part number, please include it with your message.